osTicket > Send reply to alternate/additional email address(es). I’m setting up another install of osTickets for another department (that needs a whole other server). In the process it was requested that they be able to change who the response address is incase they need to send it along to someone else or in order to include multiple addresses. The following is a simple MOD I came up with that seems to work as desired. As always please let me know if you have any questions or notice any problems. This has been implemented with 1.6RC and 1.6ST and both are functional with the exact same code. Note: This is for use with sending mail via the PHP mail function and is not intended or coded for use with SMTP sending. // Just in case they wiped out the send address we still need to make sure it gets somewhere. 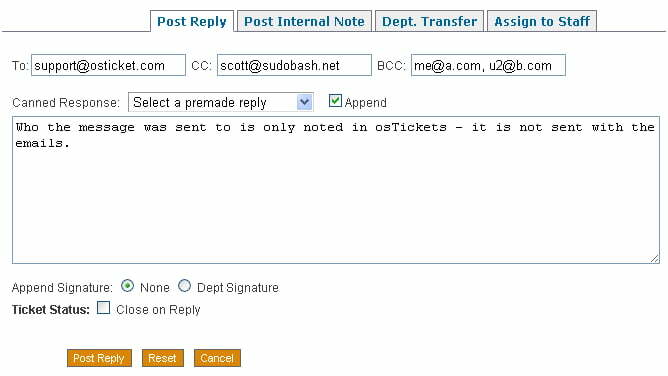 // Make sure that tickets is sending via php mail function not smtp or this will not work. The following picture shows the “To”, “CC” and “BCC” boxes that allows for changing or adding to the email address to send to. This is automatically filled in with the original email address of the ticket submitter. You can send to multiple email addresses by separating the emails with a comma (bob@example.com, bob2@example.com). Its also user proof… if someone wipes out the email address and doesn’t enter in anything then it will default to the original email address. Well thats very nice but if we don’t note who we sent it to then we could be getting very confused. Please let us know where we sent what responses to. This note is added to the response database entry but is stripped before emailing the response to the customer.